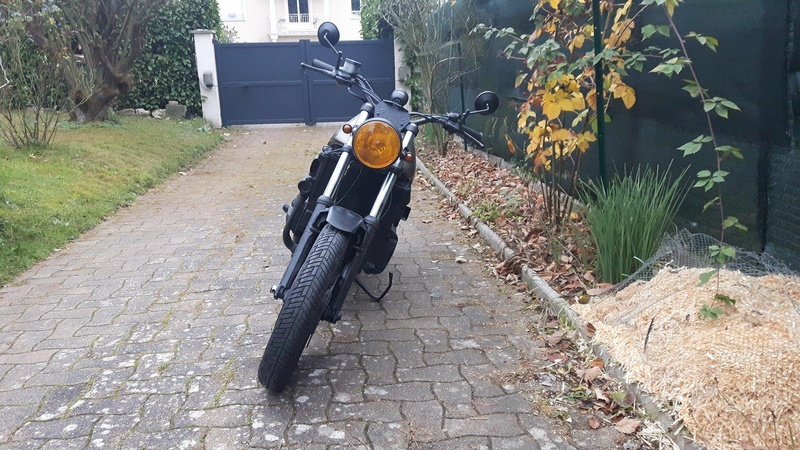 I have a 1991 K75 and I customized it on a kind of Scrambler. My project is almost done and I took the time to do it because I didn't want to my mechanical engineering diploma. I tried to build has much as I can, and I like to find the inspiration by looking at a bunch of pieces in my workshop. 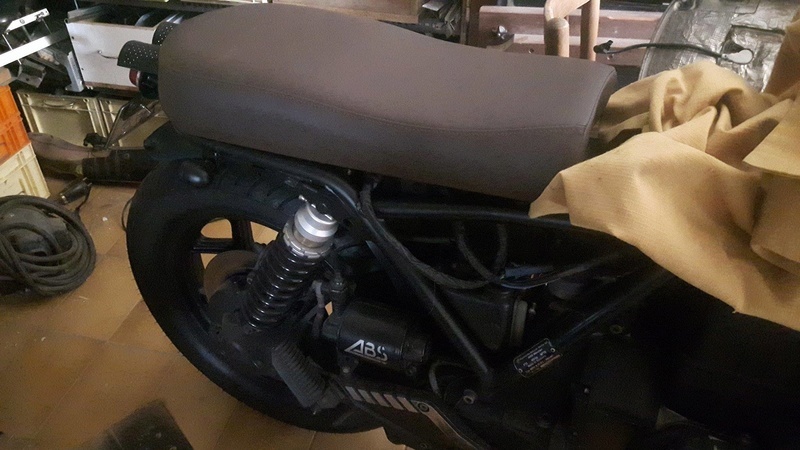 The tricky part is for the speedo, like many people, I bought an Acewell and like many people, I'am struggling with the wires so I'll try and just let you know how it goes ! 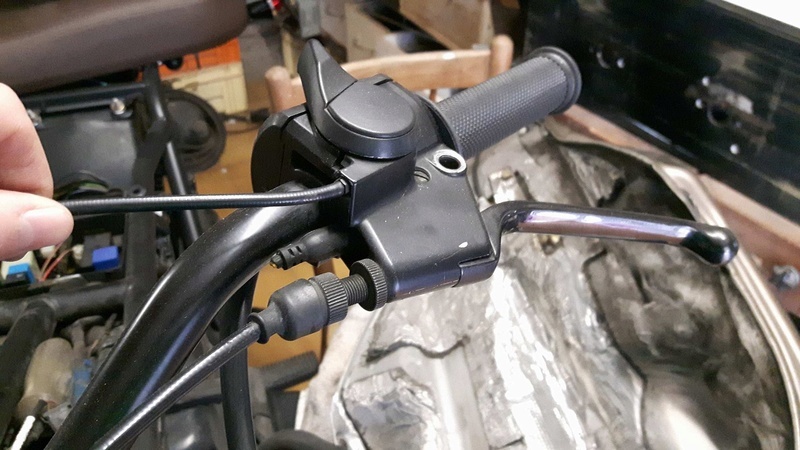 The best way to install an Acewell speedo on a K bike is to buy the BEP 2.0 or 3.0 from Maru Labs which allows you to simply plug and play your old speedo with a new one, very simple, very clever, but very expensive to, more than 130€ for the BEP 2.0. Too expensive for me so I decided to inspiring myself from Maru labs because it is an open source system so you can build your own one. It's in german but I have nothing better, if you have please share ! I can build just the speedometer conditioning circuit if you need that functionality. The tach is easy. Either wrap 6-7 turns of 22AWG stranded wire around the spark lead for Cylinder #1 and attach the other end to the RPM input on the Acewell. Or connect the RPM input of the Acewell to the Black/Blue wire (Pin 16). This may require a conditioning circuit to prevent the RPM needle from jumping around at low RPMs. Sorry, I was very busy this week ! Thanks Robmack, it's very helpful ! The Neutral circuit is perfect. 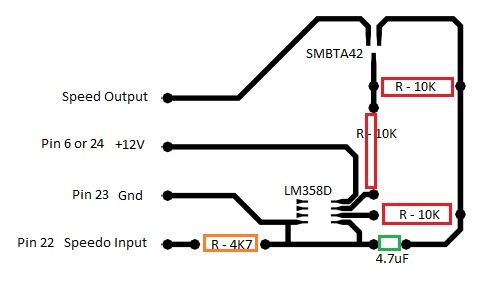 In fact I would like to improve my skills and understand how it works, so I'll try to build the neutral circuit and the speedo circuit, thank you for the diagram. I'll do what you said for tach, it's not very dificult. I have a question for the neutral circuit, which wire goes to my Acewell ? Because I think Pin2 = C ; Pin3 = B ; Pin4 = A ; Pin2 = A ; Pin6 = Start enable and the Neutral goes to the Acewell right ? The pin assignment you outlined is incorrect. Yes the neutral output goes to the Acewell. 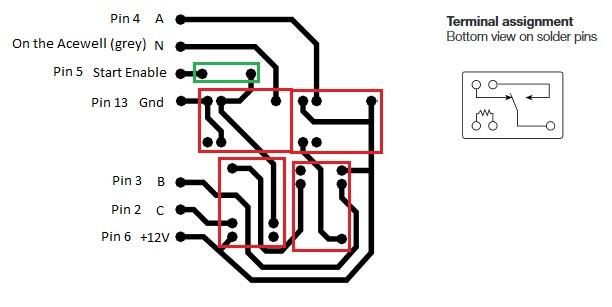 Or, instead of this kind of transistors above, could I use SMBAT42 like the speedo circuit ? I'm not sure I understand where you are referencing the transistors K1 - K4. The neutral detect circuit has no transistors in its construction and the speedo conditioning circuit uses an Op-amp, a small signal transistor and some passive components. Those N-channel and P-channel FETs you linked are quite large. Can you help me understand where you are going to use these devices? As for the relays and diode you've selected, they will work just fine. Ok thank you ! In fact, I'm trying to find the good componants for each circuit. The speedo circuit is ok for me, I identified the differents componants. I've just some trouble with the neutral circuit to identified the componants in it. 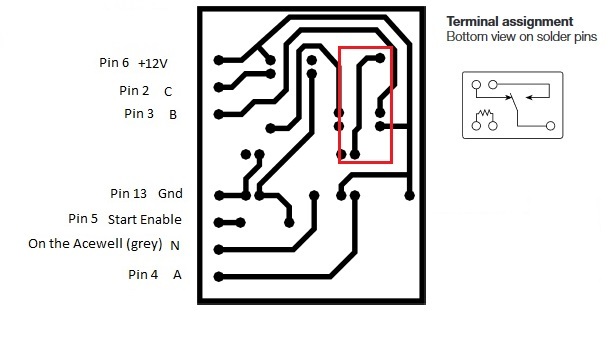 The PCB is derived from this schematic. The red circled and yellow circled pads are the 5 pins for a complete relay - 2 for coil, one for common, one for NO and one for NC. 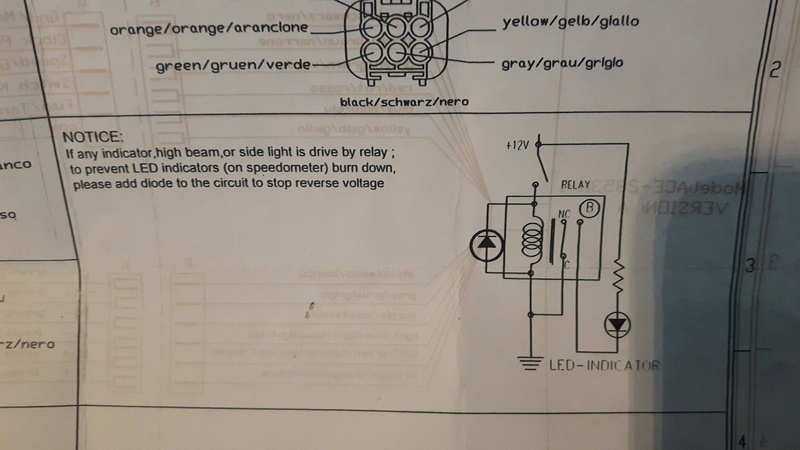 You can actually see the connection outline on the top silkscreen, with the contact arrangement, coil and relay outline. I've sent that design off for manufacture and it is on its way through the mail to me. The relays I selected in that design are SONG CHUAN 833H-1C-C.
Okaaayy ! I understand ! As you can see, I need to learn more ! I bought the componants, they will arrive next week. I hope to build the circuits next Sunday. 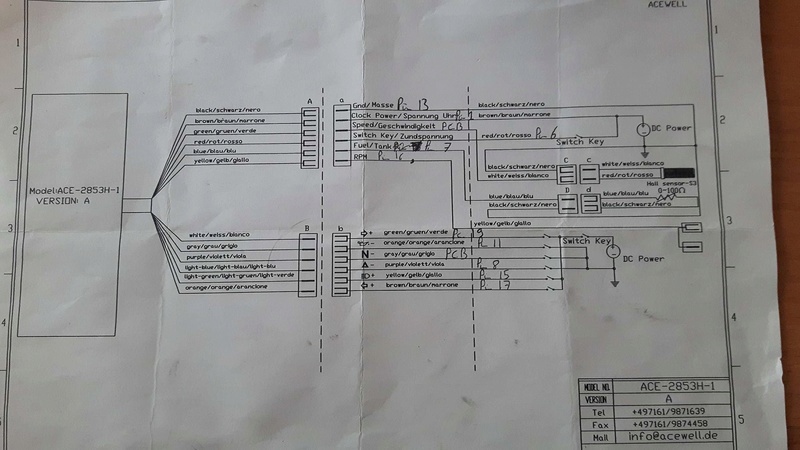 Ok so I received all the componants for the PCB and I redesign the neutral circuit because my relays are different from the SONG CHUAN relays. I'll build the circuit tomorow. But before that, I installed the Acewell and connect the wire without the PCB, just to see what happens. 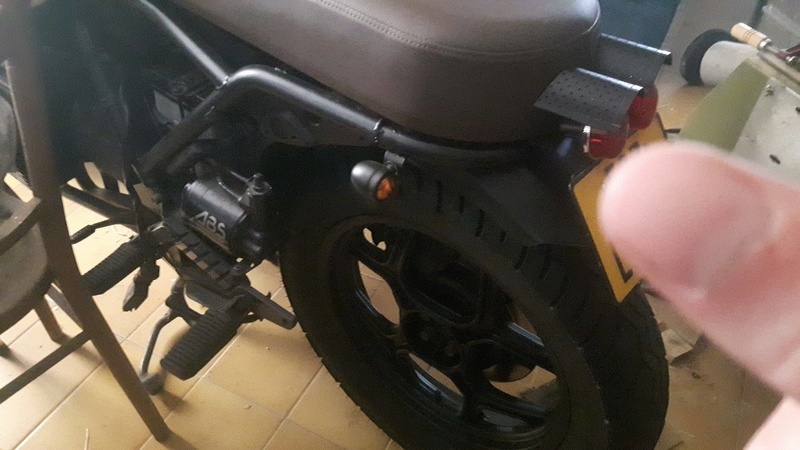 Plus, I noticed that if I don't connect blinkers, the horn doesn't work besaute it is part of the closed circuit with the blinkers. Because you haven't finished building and installing your neutral detect circuit. Have you tried pushing the start button while pulling in the clutch? From your pictured in the first post in this thread, it looks like you have aftermarket lighting. Are the signal lamps actually LEDs?? If so, that will account for the weird operation of the signals. The flasher relay is not compatible with LEDs as it stands. You have to modify it slightly to make it work properly. This is because there is something going on with your righthand switch cluster. 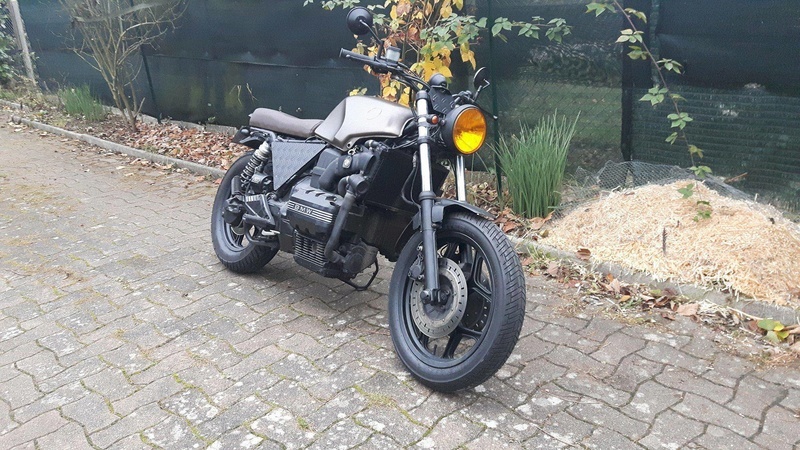 I see that you have a Euro style cluster with a headlight switch. There is a problem with that switch or the connector or the continuity over the White/Yellow wire from that switch to the Hi-Lo switch in the lefthand cluster. Trace the that wire to find out what's going wrong. Ok great to know that ! 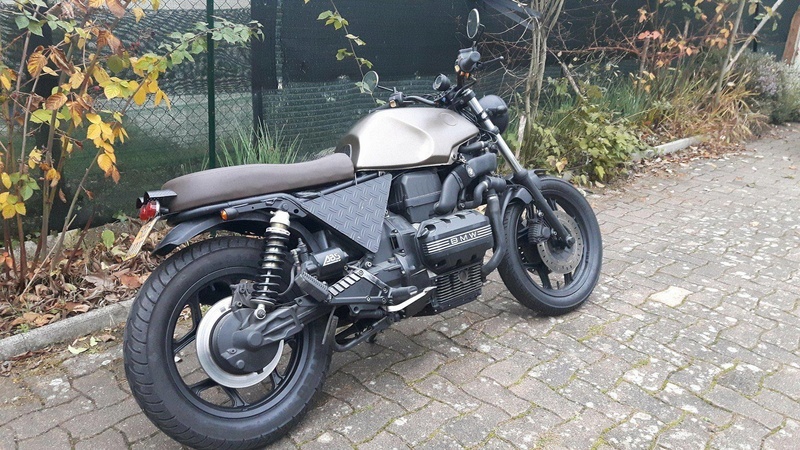 - The bike doesn't start while pulling the clutch, in fact, I think the previous owner cut the wire of the clutch detector, so the moto doesn't detect the pulling clutch and the engine stay silent. 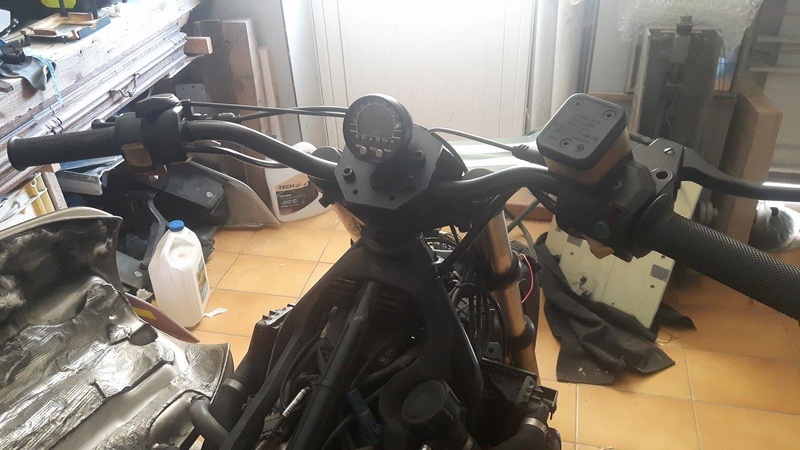 -Blinkers are not LED, but with classic bulb, when I had the original speedo, everything worked fine, it's at this moment that I decided to change the speedo. So the blinkers were working well, they were flashing a bit faster than the original (too much if I'm honest), but they were working well. - Ok I will investigate for the high beam problem ! Thanks Robmack ! I let you know how it goes ! I read in one of your post that it was important to add a LED to enable the alternator. Maybe my blinkers problem is caused by the not connected pin 24 and 18 ? I saw your blog, very impressive ! Should be and you actually didn't connect a Brown wire. Other than those small items, the wiring looks correct. The fact that Ground on Pin 18 is not connected is not an issue. Brown on Pin 23 needs to be connected to your PCB; I hope it is. Pin 24 is switched power but you already have switched power from Pin 6, so not an issue either. Am i consered about that ? 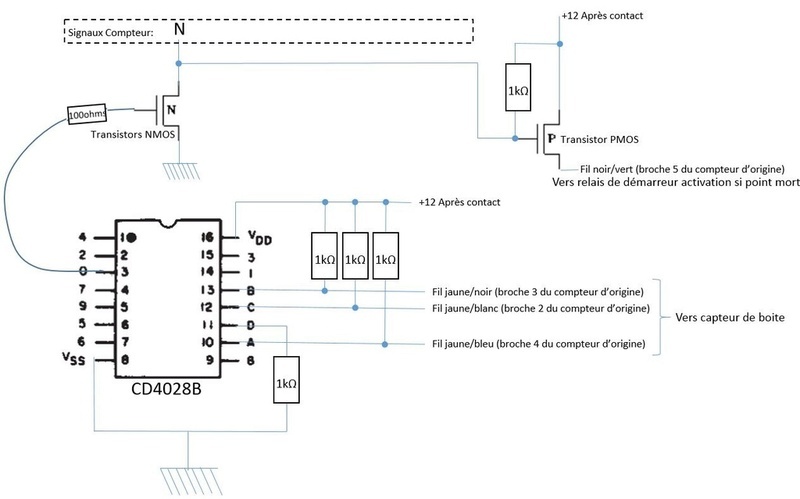 The flasher "relay" is not really a relay as used in that context refered to in your picture from the manual. The K75 flasher "module" (as it may more aptly be called) is a complex electronic circuit, and not a simple relay as may be found on Japanese motorcycles. You need to read that page I linked to. 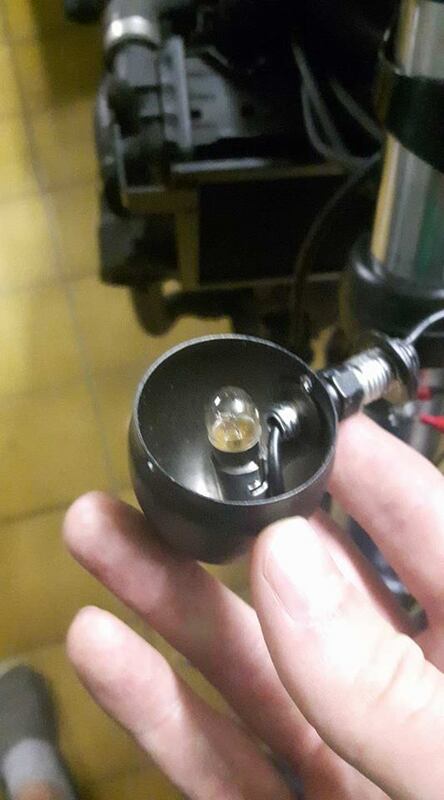 here the pictures of the turn signals, it's not LED is it ? Okay, I read that if the bulb has not the same power to the previous one, the flash could be slower or faster. If it's faster, adding a resistor in parallel could solve the problem. I'll check that after having installed the Acewell properly ! All the circuits look correct. IT WORKS PERFECTLY !!!! The moto starts ! Today, I'll make the tacho PCB and I'll try to figured out why do the blinkers doesn't work properly. Maybe It's because there is no more button for the warning, I think It could be an explanation. So first of all and in order to don't create new problems, I'll installed all the bulbs, all the button and I'll see what happens. Then I could try something else. For the blinkers, I had an idea, because the fast flash comes from the difference of power between the old and the new bulbs (old 21W / New 5W) so the idea is to consume more power. 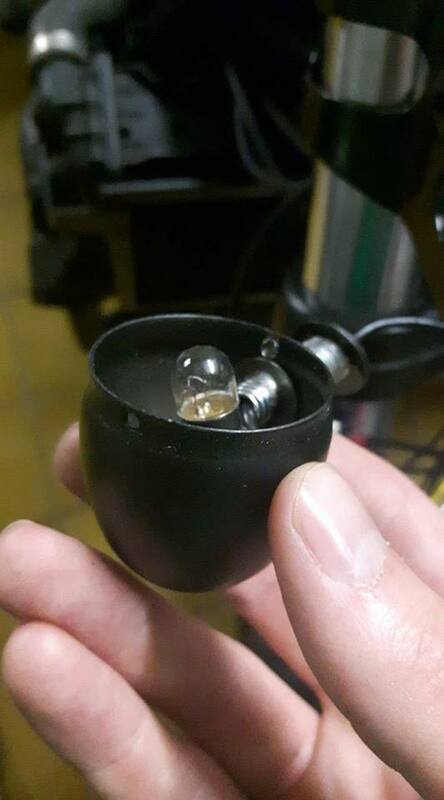 A resistance could be an idea but it'is a bit difficult to find the appropriate one, so an idea could be to hide bulbs on the circuit to consume more power. Just an idea, I'll study that option later. Congratulations on the neutral detect circuit working. If the bulbs are lower wattage than BMW specified, the flasher module will hyperflash (blink the bulbs at a higher rate than normal) LEDs cause the same effect as low wattage bulbs. 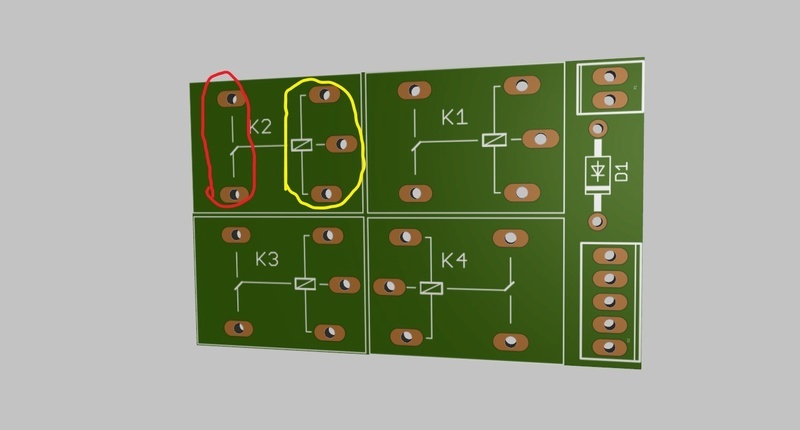 Adding a parallel resistor across each bulb will solve the problem but a better, easier solution is to cut the PCB trace as detailed in that link I pointed you to in Post #17 above. Parallel resistors will consume power and only create heat which is a waste. You'll have to size the resistors properly as well as find a way to heat-sink them to the frame so they don't overheat. I finished to solder every wire and it works perfectly ! For the blinker I just had to buy new bulb with the good spec. --> 12V 22W something like that so now they flash at a normal speed. 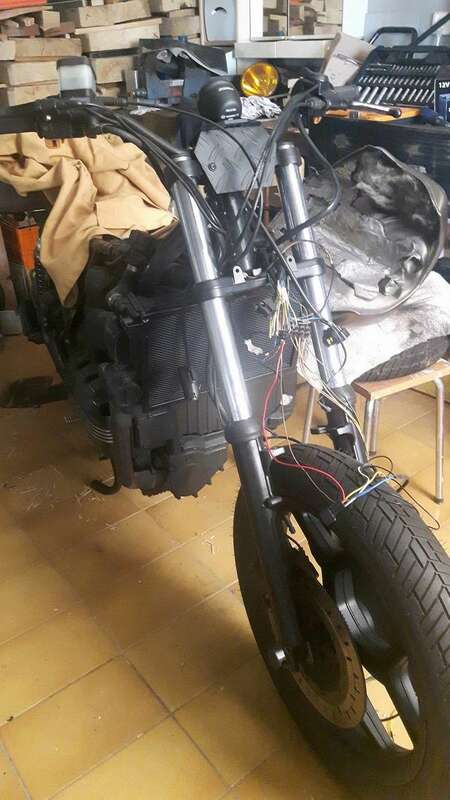 For the tachymeter, I rolled a wire aroud the wire of the 1st ignition coil and I had to add a resistance of 1Mohm to get more steady signal so now it works perfectly.